Register by clicking “Register”, indicate required data and accept Terms of Service. To activate your account log in into the e-mail address provided during the registration and click on the activation link. Otherwise your account will not allow you to use of maintenance free bike rental. Use city bikes whenever you feel like. You should select the option of Registration on the website www.szamotuly.bike and fill out the registration form. Remember to confirm the activation link, which was sent in message to your e-mail address provided during the registration. All you need to do is approach the terminal, press the button of “Rental” and follow the instructions displayed on the terminal. The bike will be automatically released from the electric lock. When the bike is secured with a clamp it must be released by means of a 4-digit code. The code appears on the terminal upon rental as well as within the mobile application. The code to the clamp may be obtained also by telephone contact with Customer Service Office. Bikes may also be rented through the use of mobile application or by contacting with Customer Office. All you need to do is enter the bike into electric lock. If you want to be sure that the bike has been correctly returned within the system, you may verify the status of rentals in the mobile application, through the website or by contacting with Customer Office. In case when the return of your bike is not possible through electric lock (i.e. closed station or lack of free bike stand) secure the bike with the clamp. Open the clamp with a code obtained upon rental, connect the bike with another bike’s handle or with a fixed element of the station. Then, lock the clamp and shuffle the digits. Remember that a bike returned in such a way must be returned within the system also. In order to do so, approach the terminal and press “Return”. Follow the instructions displayed on the terminal screen. Bike connected in such a way may be retuned via mobile app or through contacting with Customer Service Office.. If you forgot the code to the clamp, check it in the mobile application or contact with Customer Office. To be certain, we recommend verifying your rental status by means of mobile application of Nextbike or by logging on your account through the website as well as by contacting with Customer Office. I have a problem with the functioning of a station or I have noticed a failure-what can I do? We will be grateful for passing information with a number of the problematic station or bike through mobile application, email message to the address of Customer Office or through telephone contact. Our team will undertake steps to remove any potential failures as soon as possible. Our employees monitor the status of the system 24 hours a day, while such submissions allow us to react even faster. How much does the use of bikes cost? Rental of a bike for up to 3 hours is free of charge. You can rent a maximum of 4 bikes at once on one account. For each bike separately the system calculates the rental time, thus you do not need to return them all at the same time. In case of non-standard rentals, i.e. 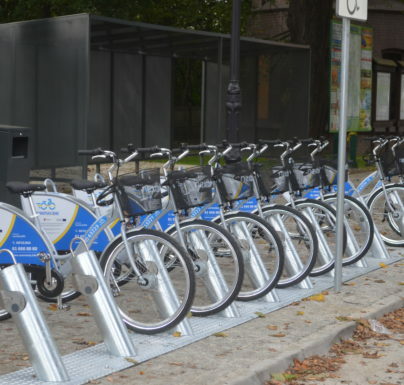 Group rentals, please contact us on the email address: grupowe@nextbike.pl. What should I do if I have a problem with rental or return of a bike at the terminal? How can I identify myself upon rental via proximity card instead of telephone number of PIN number? 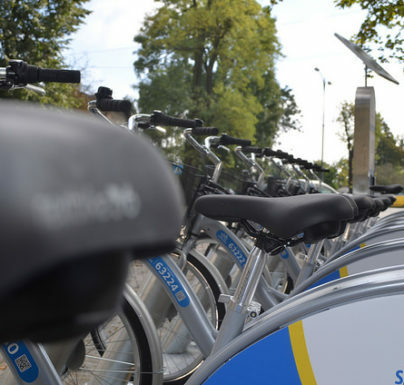 In order to facilitate and simplify the process of bike rental, identification may be conducted by means of each device which has the function of contact-free identifier. This is the majority of plastic proximity cards-i.e. City card, Electronic Student Card or the majority of payment cards. In order to register the card you must approach the terminal, enter the telephone number and PIN code and then place the card in the indicated place. Upon subsequent rental you may identify yourself at the terminal by means of the card, that is place the card in order to log in. 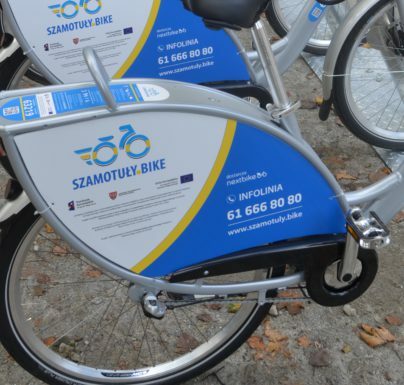 If you wish to log in only by means of the card, without indicating PIN number-mark the option “ During each rental and return, for safety reasons, ask me about my PIN number” on your account on the portal www.szamotuly.bike. Can I rent bikes by means of Nextbike application? Of course, through the application you can rent a bike locked in the electric lock as well as one secured by means of the clamp. If you wish to rent a bike by means of the application you may select two options: entering its number in the application or scanning the QR code. The bike secured with electric lock will be automatically released if it is secured with a clamp the code to the clamp will be displayed in your mobile application. I have a problem with my rental-after indicating a telephone number and PIN number I am asked to indicate a credit card number as if I was to register myself from the beginning. What should I do? Normally, during identification the request to enter a credit card number should not appear. Such a situation may occur if, for example, you enter an incorrect telephone number and the terminal will identify you as a new user who does not have the funds. The terminal asks for indication of credit card number also in a situation when there is less than 10PLN on the account. It is best if you try once more to enter your data correctly in order to log in or else, contact with Customer Office. There are no bikes on the station-why? Can I take a break in my ride and leave a bike for several minutes? Of course, however common sense is key in each such situation. Do not leave the bike in remote places or “risky” ones and secure it with a belt or with a digital lock, connecting it to a fixed, solid element and you may be sure nothing will happen to it. Be sure that no other person will be able to use your bike-secured for a moment, during a ride, with a digital lock-or rent it via mobile application or QR code, since the bike will be visible in the system as rented. Is the use of internet service, especially while logging and making payments safe? The login sites, registration site and “My account” are coded via SSL, which is visible through the link upon entering each of these sites. Websites which launch Nextbike API application are additionally encoded but they function in the iframe mode thus it is not visible within the address tab. Moreover, encoding of the entire service is switched on and set as default. We thus guarantee that the use of our website is 100% safe at each stage.